On Wednesday, billionaire Mark Zuckerberg will hold a meeting with “leading conservatives,” embattled The Blaze head Glenn Beck, and former George W. Bush Administration official and co-host of Fox News Channel’s The Five Dana Perino, at the website’s Menlo Park headquarters to discuss Facebook’s conservative media suppression and censorship scandal. In spite of this, Zuckerberg denies any wrongdoing, stating “we have found no evidence that this report is true.” He is instead planning to hold a session Wednesday where he will essentially “pat conservatives on the head” with a photo-op that is a direct testament to the fact that nothing has changed. It is also quite telling that he has reached out to Beck, who is struggling to remain relevant in the conservative media sphere. Beck announced the meeting in a Facebook post on his page early Sunday morning. Beck and Perino will be joined by Arthur Brooks of the American Enterprise Institute, CNN’s S.E. Cupp, and Mitt Romney’s former digital director, Zac Moffatt. It is also important to point out that nearly every “leading conservative” listed above who has accepted and confirmed their attendance on Wednesday is part of the anti-Trump or “Never Trump” movement. The move to invite from this school of “conservatives” flies in the face of Zuckerberg’s claim of creating a diverse group for the discussion. One exception is Moffatt, who has stated his willingness to work with Trump. “Of course we would work for the RNC under Trump,” Moffatt said. Additionally, Facebook’s Trending News chief, Tom Stocky, is a maximum political donor to Hillary Clinton. Breitbart News has also pointed out that of all the donations from Facebook employees, Clinton has received the most. Beck, as many may recall, took the liberty of mocking Republican presidential frontrunner and billionaire Donald Trump last month in a video where he smeared a bowl of crushed-up Cheetos crumbs all over his face. He did this after delivering a “farewell address” to his 40 laid-off employees from his replica Oval Office. 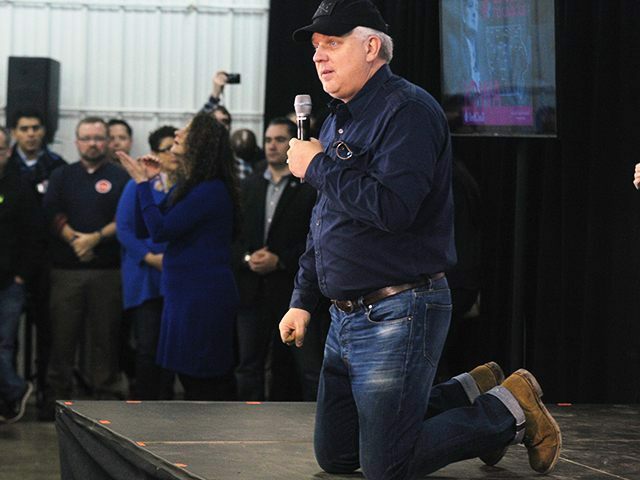 On Sunday, Beck reacted vehemently to the Drudge Report’s observation that Zuckerberg invited anti-Trump “conservatives” to his photo-op and that Beck is to “grovel at Zuckerberg’s feet” on Wednesday. With Beck’s The Blaze website imploding, the photo-op meeting with Zuckerberg could not have come at a more opportune time. It could easily be seen as a gift to Beck who is desperate to garner viewership and to increase his relevancy at a time when his stature is decreasing. In January, Breitbart News leapt to the #12 spot in the world on Facebook, eclipsing other major news outlets such as CNN, the Washington Post, Yahoo!, and ABC News. This is despite Facebook’s attempts to game the system against Breitbart. An interview between Breitbart Tech editor Milo Yiannopoulos and Mark Zuckerberg on the topic of free speech and Facebook’s suppression of conservative media. Milo will interview Zuckerberg anytime, anywhere—and we’ll agree to have it broadcast on your live video platform. Facebook to immediately cease its active suppression of conservative media, as extensively reported by Gizmodo, The Guardian, and myriad other news outlets. Indeed, Facebook’s Trending News chief, Tom Stocky, is a maximum political donor to Hillary Clinton. So there’s no need to “discuss” anything. Facebook did it, Facebook got caught, and it must end.